Don’t you just love Harry Potter baby names? Not only did JK Rowling give us an entire fantasy world complete with unforgettable villains and heroes, she also bestowed the most amazing names on her characters. The first novel debuted in the UK in 1997, and a year later in the US. It became a sensation, with a series of eight hit movies beginning in 2001. Even if you’ve never read a single word of the novels, or seen a minute of the movies, you almost certainly know something of the tale. Orphaned boy discovers he’s a wizard, and saves the world by facing down the evil Voldemort. To make this list of Harry Potter baby names, a name has to be distinctive and different – magical, if you will. I omitted many choices, like the Weasley brothers, because they’re mostly standard English names: Ron, Charlie, George, Fred. I also tried to stick to major characters, featured in the books and the movies. Dozens upon dozens of more minor figures also answered to amazing names, too, but to qualify as Harry Potter baby names? They need to be front and center, heroes or bad guys whose stories we know. 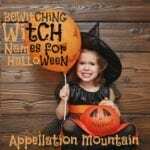 Read on for my picks of the best Harry Potter baby names, and an exciting announcement about this year’s Great Halloween Baby Names contest. At first glance, Alastor looks like a form of Alasdair, the Scottish form of Alexander. That tracks – after all, Alastor Moody was Scottish. Plus, he served as an auror – a sort of sheriff of the wizarding world – and he was hired as a Defense Against the Dark Arts professor, both positions consistent with Alexander’s Greek meaning, “defender of men.” Except Alastor has separate Greek roots. It was a name associated with Zeus, and means avenger. Of course, that works here, too. I’ve yet to write about Alastor, but check back and I’ll update when I do. In Greek myth, Andromeda is a princess rescued by Perseus. In Harry Potter, she’s the mother of fearless auror Nymphadora Tonks. While we don’t meet Andromeda directly, we hear about her quite a bit. Not only is she Tonks’ mum, she’s also sister to notorious baddie Bellatrix and Mrs. Malfoy, Narcissa. 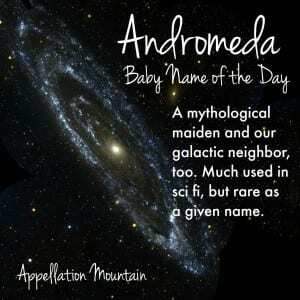 Like so many in the Black family, Andromeda’s name comes straight from the night sky, in this case, a galaxy that neighbors our own. Rare, but wearable – though unless we hear more of Andromeda in a future spin-off, her character isn’t prominent enough to give the name a boost. Read more about Andromeda here. Classic and kingly, Arthur brings to mind the noble ruler of Camelot, the leader of the Knights of the Round Table in so many medieval stories. When we meet Arthur Weasley, he’s the big-hearted patriarch of the Weasley family, dad to Harry’s bestie, Ron. The Weasleys become Harry’s surrogate family. And while at first he’s just a dad, we eventually see Arthur for the courageous, upstanding hero he is. It seems like Harry Potter should’ve launched Bellatrix. It’s a gorgeous name, sharing sounds with Bella and Beatrix. The meaning – female warrior – is promising. And Bellatrix is a big character, played with verve by Helena Bonham Carter. So why were a mere 29 girls named Bellatrix last year? I’m guessing it’s because the character is an unrepentant villain, responsible for horrible atrocities in the series, with no redeeming qualities. Too bad, because the name is drop-dead gorgeous! Read more about Bellatrix here. Sir Walter Scott created this name for his 1819 novel Ivanhoe, based on the older – and less romantic – Cerdic. But it’s Harry Potter that could reinvent this name. A young Robert Pattison played the part, pre-Twilight. Cedric Diggory, in books and film, came across as handsome, fair-minded, and brave. Good qualities, all, even if circumstances put him at odds with Harry. It’s a name we all recognize, but seldom hear on a real boy. And while it continues to fall in use, a generation raised on these tales could change all that. Read more about Cedric here. As with Bellatrix, Draco pays a villain penalty: would you really want your son named after a Malfoy? In fairness, Draco is a great name. It’s the Latin word for dragon, and it fits right in with many an old wizarding world family name, borrowed from a constellation. A handful of notables in the ancient world answered to the name, too, including an Athenian legislator known for his harsh approach to law-giving. He’s the source of our word draconian. But with that bright ‘o’ ending, and the dragon imagery, this name could escape its darker side. I’ve yet to write about Draco, but check back and I’ll update when I do. Fleur is simply the French word for flower, and it has a long history of sparing use as a given name. There’s a Saint Fleur – though in English, we call her Flora – dating to fourteenth century France. A handful of places are named in her honor. In the Wizarding World, Fleur Delacour is a talented witch enrolled at Beauxbatons, one of the European schools. She also proves herself brave, loyal, and quick with a wand in the Battle of Hogwarts. I’ve yet to write about Fleur, but check back and I’ll update when I do. While her brothers have rock-solid English names, the youngest Weasley is Ginny, short for Ginevra. She’s the first girl born into the Weasley family in generations. I couldn’t find an explanation for her unusual given name. It’s popular in Italy, where it’s associated with the word ginepro – juniper. Though I usually see it listed as the Italian form of Jennifer or Guinevere. The latter, of course, ties it to the Camelot stories, just like her dad’s name, Arthur. Leonardo da Vinci painted a famous portrait of an Italian noblewoman by the name in the 1470s; in the early 1800s, Percy Bysshe Shelley used the name in a poem. It fits right in with Genevieve, Juniper, and many other stylish names of the day, but is firmly rooted in all things Harry Potter, too. I’ve yet to write about Ginevra, but check back and I’ll update when I do. We’re just wild about Harry, aren’t we? He saved the world – more than once! In England, it’s been a Top Ten favorite for years, almost solidly since the novels were first published. It fits right in with the cozy nicnkame-names the British love. In the US, we’re all about Henry and Harrison, but Harry tends to go overlooked. And yet, it’s the kind of classic boy’s name that will almost certainly make a comeback. The advantage of Harry? While the boy wizard comes to mind, it’s such a solid, traditional choice that it doesn’t feel too tied to the series. The name’s everyman quality is surely one of the reasons JK Rowling gave it to her unassuming hero. Read more about Harry here. 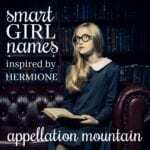 Whipsmart with courage to match, Hermione Granger is a newcomer to all things magical when we meet her, but she fights to save her adopted world as bravely as its native sons and daughters. A feminine form of Greek messenger god Hermes, there’s also at least one Hermione in myth. Shakespeare used the name for a character in The Winter’s Tale, too. But it’s Miss Granger who comes to mind instantly when this name is heard. Calm and commanding, we meet Kingsley Shacklebolt as a fearless auror helping to protect Harry, and later secretly aiding the good guys. He eventually becomes a reform-minded Minister of Magic. This is one of the names that clearly benefited from the series’ success. We don’t meet Kingsley until book five, published in 2003 and released as a feature film in 2007. While the wizard wasn’t the first to answer to the name – think of author Kingsley Amis – he clearly gets credit for boosting its use. It helps that regal Kingston and King are both quite popular today, too. Read more about Kingsley here. In an age of botanical baby names, Lavender is rare – but perfectly plausible as a girl’s name. In the books, she’s sorted into Gryffindor along with Harry, Ron, and Hermione, but stays mostly in the background until she dates Ron in their sixth year. It’s the kind of nature-inspired choice that we hear often in JK Rowlings’ character names. It’s also a great candidate for a stands-out/fits-in choice. We love the similar shade Violet, the letter ‘v’ is big, and girls’ names ending in -r, like Harper and Piper, are having a moment, too. I’ve yet to write about Lavender, but check back and I’ll update when I do. If any name was clearly launched by Harry Potter, it’s Luna. The Latin – and Spanish – word for moon, Luna was used in small numbers more than a century ago. But it started to rise after we met quirky, but fearless, Luna Lovegood. The witch became an early ally of Harry and his friends, and fights on their side. Other reasons we embraced the name? Stella – Latin for star – was already wildly popular, and we’ve embraced names like Lucy, Lily, and Layla, making Luna a natural fit. Celebrity power couple John Legend and Chrissy Teigen named their daughter Luna Simone in 2016; Penelope Cruz and Javier Bardem also gave the name to their child. Read more about Luna here. The Roman goddess of wisdom makes a fitting namesake for Professor Minevera McGonagall, the no-nonsense head of Gryffindor House. While this name regularly appeared in the US Top 1000 through the 1960s, today it has fallen out of use, even as the Greek goddess equivalent, Athena, soars. Could that change? I like the name’s vintage vibe, and nickname Minnie seems every fit as appealing as Millie. In many ways, it’s a perfect choice for parents after a name everyone will recognize, but no one will share. Read more about Minerva here. When we first meet Neville Longbottom, he’s a bumbling first year Hogwarts student, struggling to do anything right. Given his status as the only son of an old wizarding family, he’s got a lot to live up to. Happily, Neville eventually finds his groove, and emerges capable and downright heroic, too. This name feels decidedly British – think Neville Chamberlain, or the powerful, medieval-era House of Neville. In the US, that sharp ‘v’ sound gives it some potential today. Neville could be a brother for equally gentlemanly names like Sebastian and Felix. Read more about Neville here. One of these things is not like the others … the proprietor of Diagon Alley’s wand-shop is master wandmaker Garrick Ollivander. I almost included Garrick on this list, but really, it’s Ollivander we hear again and again. 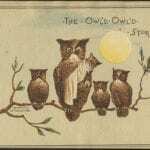 It sounds like a smoosh of Oliver and Alexander, two handsome chart-toppers parents love. JK Rowling has written that the surname means “he who owns the olive wand.” 31 boys received the name in 2017, which suggests it has potential. I’ve yet to write about Ollivander, but check back and I’ll update when I do. Finn is a big hit, as are many Finn names. 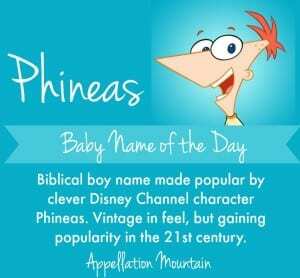 But Biblical Phineas – also spelled Phinehas in the Old Testament – remains rare. It makes this list thanks to former Hogwarts headmaster Phineas Black, often seen sleeping in Professor Dumbeldore’s office portraits. Phineas is ancestor to Sirius Black. Like many in his family, he was sorted into Slytherin House. Fun fact: some speculate that the name means “serpent’s mouth.” Despite all of these reasons you might expect Phineas to be a bad guy, we learn that he supported Muggle rights and got his name scratched off the Black family tree. Better known as one-half of the Disney Channel duo Phineas and Ferb, but still plenty magical. Read more about Phineas here. Madame Pomfrey, the capable and no-nonsense Hogwarts nurse, has the first name Poppy. Since nature names are big in the wizarding world, it sounds just right. But poppies are also known for the medicinal uses, making it a fitting choice for a medical professional. As a given name, it’s caught on dramatically in recent years. Perhaps some credit goes to Harry Potter, but I suspect it has more to do with our affection for all things botanical. Read more about Poppy here. Harry Potter fans immediately think of Remus Lupin. He’s a former best friend of Harry’s dad, James, and the most capable Defense Against the Dark Arts professor Hogwarts has seen in years. Unfortunately, he’s also a werewolf, and that causes some complications – and shortens his tenure at the school. In myth, Romulus and Remus were the co-founders of Rome. Since the twin brothers were suckled by a she-wolf after their grandfather ordered them killed, it seems like a fitting choice. While Remus isn’t very common as a given name, with the rising popularity of the unrelated Remy, perhaps this name will catch on still. It was given to 25 boys in 2017 – a new high. Read more about Remus here. 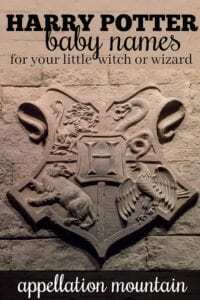 Madam Rosmerta owns The Three Broomsticks, the cozy inn and pub at the heart of Hogsmeade village. While it sounds like yet another Rose name, Rosmerta is Gaulish. It comes from a Gallo-Roman fertility goddess, and the name means something like “great provider.” Fitting for an innkeeper! Read more about Rosmerta here. Rowena Ravenclaw co-founded Hogwarts, and had a house named in her honor. Students sorted into Ravenclaw were known for diligence and smarts; at one point, Hermione mentions that the Sorting Hat considered sending her there instead of Gryffindor House. Geoffrey of Monmouth mentioned the name, and it became popular thanks to a character in Sir Walter Scott’s Ivanhoe. Read more about Rowena here. For much of the series, Professor Severus Snape appears to be Harry’s nemesis, and perhaps an ally of Voldemort, too. We later realize that things are far more complicated than they first appear. Severus means stern in Latin, a name that just plain fits the sour-faced potions master. 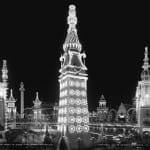 But the name has been worn by plenty of historical figures, including Roman emperors and at least one saint. I’ve yet to write about Severus, but check back and I’ll update when I do. Sirius sounds like serious, and when we first meet him, the situation is grave indeed. Sirius Black has just escaped from the wizard prison, Azkaban, from which no one ever escapes. Everything suggests that he’s headed to Hogwarts to attack Harry. The truth turns out to be far more complicated – and happier, too! A member of the distinguished Black family, Sirius proves himself a tireless fighter against Voldemort, using his wealth to help fund the resistance. As befits a wizarding world aristocrat, his name comes from the night sky, Sirius – the dog star, since it’s located in the constellation Canis Major. I’ve yet to write about Sirius, but check back and I’ll update when I do. Hogwarts’ Divination professor, Sybill Trewlaney, has an unconventionally-spelled given name. But it fits – after all, a sibyl was a female prophet of the ancient world. The name persisted over the centuries, and took on Christian overtones. It was the name of the youngest Crawley sister in another beloved British series: Downton Abbey. Despite all this, Sybill – in any spelling – is still seldom heard. That said, Sybil – the most popular spelling – has increased significantly in use in recent years. So maybe this one will join Luna and Kingsley on the names boosted by Harry Potter list eventually? 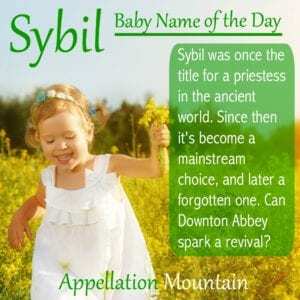 Read more about Sybil here. Harry Potter Baby Names: The Big News! Last October, we voted for our favorite name borrowed from a witch or a vampire. It was a tough contest, but in the end, witches won! 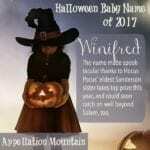 Winifred took home the title in our first-ever Great Halloween Baby Names contest. This year, we’re choosing our favorite Harry Potter baby names instead! We’ll vote our way through witches and wizards until we arrive at our top names for each. Check back on Saturday, October 6th for the contest launch. And tell me: what are your favorite Harry Potter baby names that didn’t make this list? Ginevra is my favorite of these. I think it’s probably a nod to Ginevra of Scotland, https://en.wikipedia.org/wiki/Ginevra_di_Scozia, which is derivative from this, https://en.wikipedia.org/wiki/Orlando_Furioso. It seems to be in keeping with Rowling’s other literary and Scottish references. Ooh – thanks, C in DC! This is a great list! I’d also include Lucius (Malfoy) and Helena (Ravenclaw) among some of the more distinctive-but-usable names from the series.